Written by Catherine Saxelby on Wednesday, 13 June 2018. Ketosis is when you push your body’s metabolism to burn stored fat for energy instead of sugar. So how do you do it? And is it good for you? How do you push your body into ketosis? To get your body to burn fat for fuel instead of carbs, you cut down your carbohydrate intake to 50 grams or less per day. That really is very little. With one slice of bread supplying 15 to 20 grams, you can see that you can't eat much, if anything, in the way of bread, rice, pasta or potatoes. Often you may see the permitted carbs written as 20 grams NET carbs on some Keto-websites. This is the US way of saying carbs minus the fibre and any undigested parts. It's equivalent to the 50 grams listed above. It's a very Atkins and somewhat old-fashioned way of talking, IMHO. As far as I know, it doesn't have any official definition. You'll get smallish quantities of carbs from non-starchy vegetables like green beans, lettuce leaves or tomatoes, so you're basically eating as if you're on a LCHF (Low-Carb, High-Fat) diet or the early stages of Atkins. You'll also be allowed to eat all the things you've been told not to eat on other diets like fatty meat, chicken with the skin on, fatty pork shoulder, bacon, butter, full-fat cream and soft cheeses. Where did this "ketosis diet" idea come from? Originally a ketogenic diet was prescribed to attempt to control seizures in children with epilepsy where all other methods and medications had failed. There have been studies which suggest that there may also be some benefits for those people with Parkinson's or Alzheimer's diseases. The average weight loss of the unfortunate participants was around 9 kilos and, impressively, most of them kept the weight loss off for more than a year. The side-effects were reported to be "a few minor side effects, like fatigue". 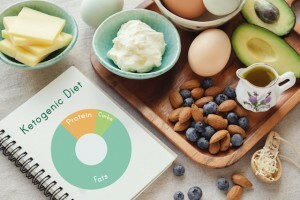 There are numerous versions of the ketogenic diet today. They pretty much all advocate a diet of high-fat foods and low carbs. UK studies have shown that weight losses on this type of diet are higher than those for calorie-counting diets. However, recent studies comparing low carb with low fat diets show little difference between the two. See my post What's better for weight loss and health? Low-carb or low-fat? Are there really only minor side-effects? That really depends on your level of health. If you have heart disease or underlying metabolic problems like diabetes, you need to discuss any such diet with your doctor. What's more, experts recommend that those with liver and/or kidney problems stay away from this diet. It's a hard slog at the beginning of this diet and that's when many people quit. They feel hungry, they get headaches and bad breath, they suffer constipation and feel fatigued. However, these often pass after the first week or so. Even so, this way of eating is not recommended long term as it does have some unpleasant, if minor, side effects such as tiredness and lethargy, bad breath, constipation and hunger. OK you've heard it before, but it's still true - moderation is the best path. If you really must give this a try then it's OK for a week or so to kick-start something more balanced long term but it'll be hard to follow for a long time. Nutritionally, you're also starving your gut bacteria of the resistant starch and other fibres they need. And as just about everybody these days knows a healthy gut biome is important for your overall good health. And remember, all carbs aren't created equal. There are good carbs - wholegrain foods, legumes, apples, sweet potatoes and other fibre-rich foods; then there are bad carbs - lollies, alcohol, sugar, processed foods such as cakes, white rice and noodles etc. After a while, the Keto diet gets pretty boring As do most diets. By all means, cut down on your carbs and then add some exercise into the mix so they get used up. You'll be doing your body, especially your cardiovascular system, a favour and it'll be much easier to maintain. Q. Atkins or more carbs?